Bachelor's Grove, a 2-acre cemetery nestled inside a forest preserve near 143d and Ridgeland in Bremen Twp., is supposed to be the private fief of a two-headed ghost. The ghost is said to live in a nearby lagoon, charged with guarding the cemetery graves. Steal a tombstone, the story goes, and he'll hunt you down. But he's not doing his job. A broken-down wire fence, defaced and toppled grave stones, beer cans and cigarette butts are evidence that the ghost is derelict in his duties. The cemetery, which holds the graves of pioneer South Suburban residents, has become a scene of frequent vandalism and is the site of almist nightly teen-age revelry. "About 30 kids a night and more on weekends," Is the estimate of Sgt. Harry Armstrong, a forest preserve ranger of the Tinley Creek Division. 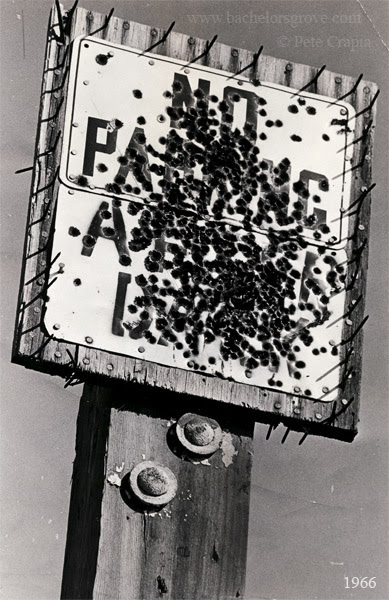 Bullet-riddled sign at entrance to cemetery reads, No Parking After Dark. Photograph was reused in separate undated Chicago Sun-Times article.